Luke Messer ’91 came to college not knowing what he wanted to do. After leaving Wabash, he has carved a career in public policy and politics based on principles he learned largely in his speech classes. "Wabash College teaches you the skills necessary to understand hard work and clear thinking," the state representative said. "Wabash is hard and that’s good because life is hard. If a student is going to excel here you’re going to have to work at it. I really didn’t know anyone who kind of coasted through Wabash and did well. I think that’s a skill that will serve you well in life." 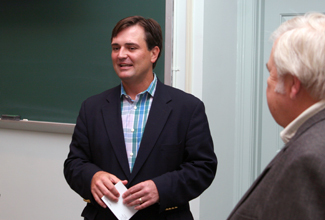 Messer was on campus Tuesday and spoke to students at the invitation of Rhetoric Professor Todd McDorman. His presentation was sponsored, in page, by the Lilly Endowment Know Indiana grant. 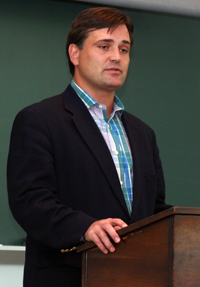 Messer, R-Shelbyville, is the current assistant majority floor leader of the Indiana House of Representatives. He also has served as chairman of the Indiana Republican Party. His comments were non-political though. He titles his remarks: "Political Persuasion: How the Academic Lessons of Wabash College Apply to the rough and Tumble World of State and Federal Politics." "Ninety-nine percent of the persuasion that happens in any discourse doesn’t happen at a podium," Messer said. Quoting Ronald Reagan and author/humorist Ben Stein, Messer realizes politics takes creative thinking in a concise manner. "I would say if you want to be persuasive it’s your job to take complex ideas and simplify them in a way that folks can understand in 30 seconds," he said of today’s sound-bite world. "That sometimes can be frustrating but that doesn’t help you achieve your goal. You have to figure out how to boil your ideas down." He cited a Wabash example that came to mind. The speech major had Professor Jim Walsh for his C&T class. He recalled Walsh assigning a one-page paper and warning everyone it wouldn’t be easy. Many of his fellow students laughed off a one-page assignment, but Messer knew that it wouldn’t be easy to say anything in just one page. "Taking information, analyzing information and then working with that information are critical skills for public policy," he said. "The ability to work hard and think clears is all you need to be successful in life." Messer will retire from the General Assembly at the next election cycle. Raising two small daughters isn’t conducive to a State Representative’s schedule. He is an attorney with Ice Miller, Indianapolis. He shared his thoughts extemporaneously with his mentor Speech Professor Emeritus Joe O’Rourke in the Baxter Hall audience. He gives his Wabash College, O’Rourke, and his liberal arts education much of the credit for his success. "You can compete with anybody in the world," he told the students. "if you come here and apply yourself. What is College about but learning the skills to follow your dreams?" In photos: Messer at podium, below, and with speech mentor Joe O'Rourke watching on at top right.